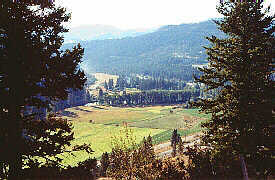 Rock Creek and the Kettle Valley, British Columbia. Easily one of BC's best kept secrets is Highway #33 that runs north/south between Kelowna in the Okanagan and the tiny community of Rock Creek nestled just north of the Canada/US border on the main road to the Kootenays. Following the course of the Kettle River this highway winds it's way through some of the most scenic landscapes in the province. Peaceful farm lands fill the valley while numerous side roads lead to fishing and camping adventures on the areas streams and lakes. Along the route, several small communities offer a variety of services; Carmi, Beaverdell and Westbridge. In the south, Highway #33 ends at Rock Creek when it meets Highway #3 between Osoyoos and Grand Forks. The community of Rock Creek offers a service station, accommodation and restaurants. 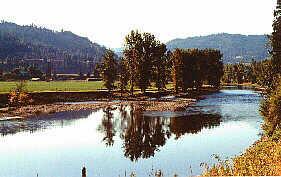 The nearby bridge over the Kettle River and oldest operating hotel in the province are worthwhile attractions to visit. The area's once prosperous gold rush of the mid 1800s led to the building of the Dewdney Trail. 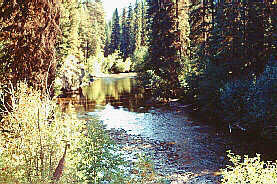 A beautiful campsite on the river allows visitors angling opportunities, good swimming and hiking. Location: Located on Highway 3 between Midway and Osoyoos.